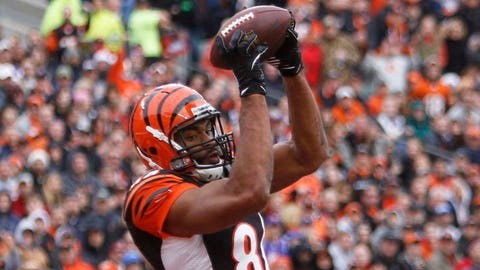 Jermaine Gresham will not play in the Bengals' regular season finale against Baltimore due to a hamstring injury. CINCINNATI — The Bengals will be without tight ends Jermaine Gresham and Tyler Eifert against Baltimore today because of injuries but linebacker Vontaze Burfict is active and expected to start. Gresham (hamstring) and Eifert (neck) have combined to catch 85 passes for 906 yards and six touchdowns this season but Alex Smith and Orson Charles are expected to fill their roles against the Ravens. The Bengals have clinched a home playoff game by winning the AFC North regardless of the outcome of today’s game but a win would keep them alive for the No. 2 seed and a first-round bye. Burfict suffered a concussion in last week’s win against Minnesota but was cleared to return to practice on Friday. Cincinnati’s other inactives are: cornerback Terence Newman (knee), running back Rex Burkhead, offensive lineman Tanner Hawkinson, defensive tackle Devon Still (back) and wide receiver Ryan Whalen. Newman is missing his third straight game due to a knee sprain. The initial prognosis of the injury was that he would miss 1-3 weeks, so the expectation is that he will be available to play in the postseason. Dre Kirkpatrick is expected to start in place of Newman for the third straight game. Baltimore will be without starting defensive tackle Arthur Jones, who has four sacks this season playing on the opposite side Terrell Suggs. He is the only starter out for the Ravens, who need help to reach the playoffs for a sixth consecutive season. The other inactives for the Ravens are: defensive back Asa Jackson, safety Omar Brown, offensive lineman Ryan Jensen, wide receiver Deonte Thompson, tight end Dallas Clark and outside linebacker and former Ohio State player John Simon.